Lauri Muranen opened the discussion with the issue of globalization, asking whether the world is entering a stage where globalization is taking backward steps. The panelists largely agreed that while some anti-globalist events, such as Brexit and the election of President Trump, have taken place, the big picture remains more complex. There has not been a direct and consistent transition to a more fragmented and closed world. The Paris Climate Agreement has been a success, and there is massive innovation driven by companies and countries alike. Mr. Härtel said that these small shifts are nothing new and that these kinds of small changes happen all the time in various markets. Ms. Kolle noted that US politics always ebbs and flows, and Trump does not get to decide everything himself even in the US. Panelists Kaarina Kolle (WWF), Christoph Frei (WEC), Carlos Härtel (GE) and Ilkka Latvala (MetsäGroup) were discussing about global energy trends. The second topic concerned the global energy demand and the implications of its forecasted growth in the coming decades. Ms. Kolle noted with concern that according to International Energy Agency’s forecasts, the global emissions will peak actually as late as 2040. Mr. Frei stressed the importance of differentiating electricity demand and energy demand, because electricity peaking is not an issue. Mr. Härtel was optimistic about the future, because 15 years ago no-one believed that solutions which are nowadays successful would exist. In the same way, the next 15 years might bring some pleasant surprises. Mr. Latvala said that the megatrends of population growth and improving living standards will drive energy demand. The use of combustion must be reduced in order to reduce CO2 emissions. About the issue of solar PV and the possible leapfrogging through renewables, the panelists agreed that it is important to use a mix of resources instead of putting too much focus into any single resource. Mr. Frei noted the importance of digital innovations and technologies in the leapfrogging process, while Mr. Latvala said that all possible low-emissions energy sources will be needed to respond to the energy demand, including nuclear. Mr. Härtel said that changing the energy system completely will be slow, because the infrastructure for the old system is still there and it takes time to renew it. When asked about the subsidies in the solar energy sector, the panelists expressed that using subsidies is one of the possible tools for governments to promote positive change in the field. Sometimes subsidies are the best option. However, the long term goal is to move away from the reliance on subsidies, and this is also happening in many places around the world. Once again, Mr. Frei stressed the importance of employing local solutions based on different constraints around the world. Mr. Latvala said that from the viewpoint of industry, the cost of energy and the reliability of energy supply does matter. The business environment should remain competitive, although it is clear that decarbonization is necessary. To conclude the panel discussion, Moderator Muranen guided the discussion towards bioenergy, which is important especially for Finland. The main takeaway from the discussion was that biomass has limited uses, but it is not a perfect solution which could be taken into a massive scale. Mr. Frei noted that even though the hype around bioenergy has decreased somewhat, it is still discussed and it could be a viable local solution depending on the conditions. Mr. Härtel expressed doubt about the scalability of biomass solutions, whereas Ms. Kolle said that the NGO sector is mostly critical towards the burning of biomass. 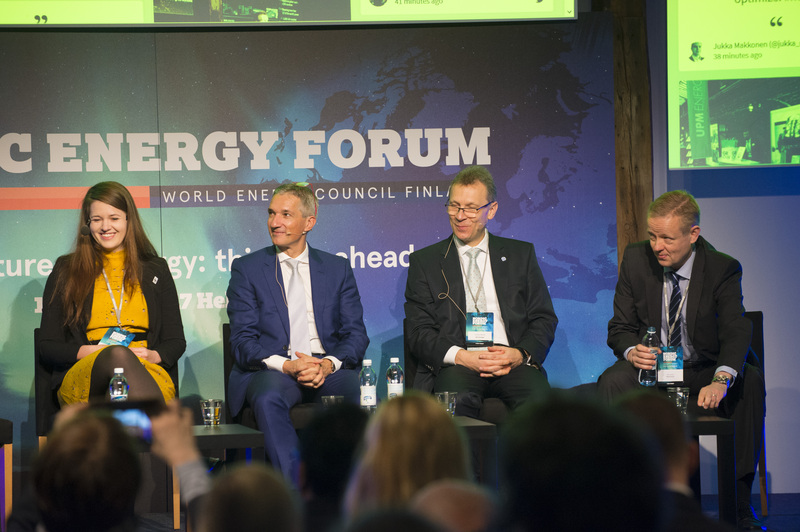 The Global energy trends panel discussion was moderated by Executive Director of WEC Finland Lauri Muranen. The participants included Senior Vice President of Metsä Group Ilkka Latvala, Climate and Energy Policy Officer of WWF Kaarina Kolle, Secretary General of the World Energy Council (WEC) Christoph Frei and CTO of GE Europe Carlos Härtel.